Meet Belle — Run, Heifer, Run! The world’s most well traveled heifer calls Run, Heifer, Run home….that is, when she’s not globe-trotting her dainty hooves across continents and over oceans. #heiferBelle is our beloved mascot here at RHR. She represents our entire herd, no matter where we are on the road to better living. We want to see it all and hear your stories! From indoor spin to outdoor cycling, from hiking in Japan to running in Texas, #heiferBelle is getting around! Where is YOUR #heiferBelle? 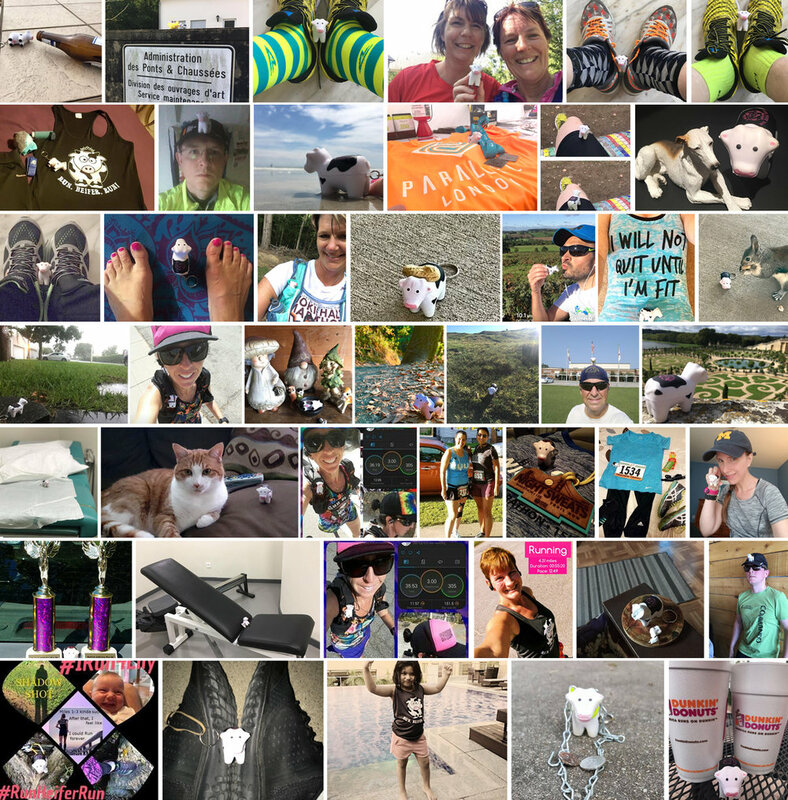 Chicago to China, Phoenix to Philadelphia, where is YOUR #heiferBelle? From Krav Maga to Spin Class, and back again, #heiferBelle gets around! Where is YOUR #heiferBelle? 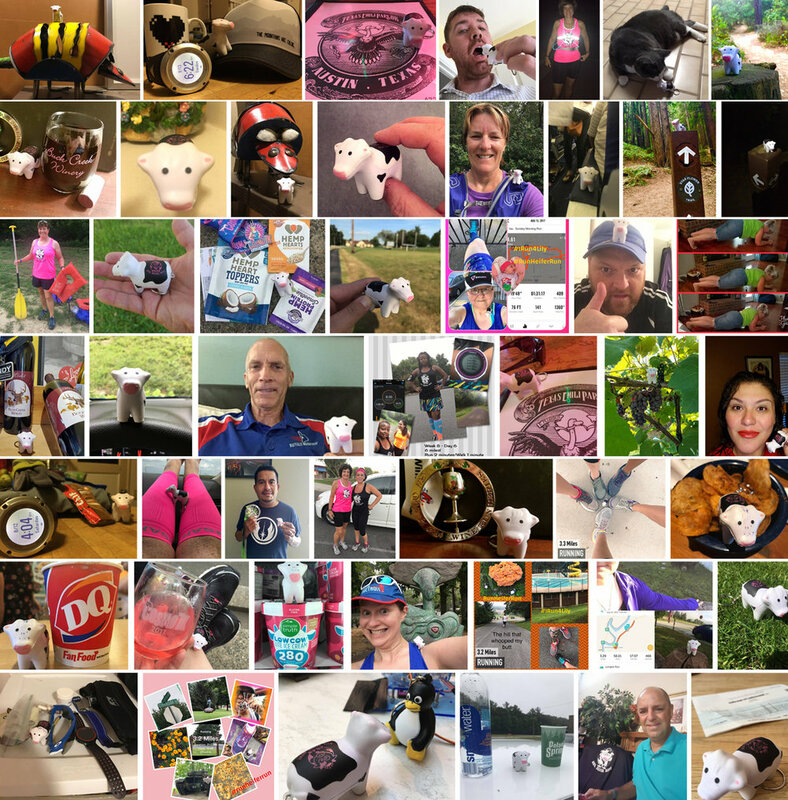 As you can see from the wide variety of pictures on this page - #heiferBelle has made her way all around the world, from Scotland to Japan, Chicago to China. Send in YOUR #heiferBelle pics and we'll add them as they come in! #heiferBelle hanging around on the post box in Scotland! #heiferBelle visited the Basketball Hall of Fame, went running with the Two Tiffanies, and even biked some miles with JenHeifer! From San Diego to The Frozen Aisle of the grocery store, #HeiferBelle is REALLLLY getting around these days. She even found $10 during a recent run! Jen's #heiferBelle is cozy all winter now in her new sweater. From ice to warm weather and inside t the gym, #heiferBelle is sure getting around! Courtney's #heiferBelle had a smoothie and a nice walk outside today in Texas! Renee's #heiferBelle went on a run this morning. In 22' wind chill..... BRRR!